Australians may have made a home for themselves amongst the gum trees, but it is the wattle tree that has found its way into Australian republican symbolism, writes history editor Dr Glenn Davies. 1 SEPTEMBER has many names. Some welcome it as spring’s dawn, a time to celebrate nature’s renewal. For others, it is National Wattle Day — a time when the smells of spring are in the air as well as Australia's vivid gold blossom. In Australia, the wattle is the largest genus of flowering plants. In Australia, you could plant two or three different wattles for every day of the year and still have plenty left over, for Australia has more acacia species than the year has days. These acacias are extremely diverse and found in habitats from rainforest to arid lands. I have written before on how Wattle Day is celebrated annually on the first day of spring. A sprig of Australia's national floral emblem, the golden wattle – acacia pycnantha – is traditionally worn on the first day of spring. The green and gold of wattle leaves and blossoms were declared our national colours in 1984; in 1988, the wattle was adopted as the official national flower; and National Wattle Day was formally declared on 1 September 1992. In 1993, the Australian Republic Movement gave its support to Wattle Day celebrations being held throughout Australia on 1 September. Wattle captures something crucial to the success of the republic — feeling for country. It is a unifying symbol. September 1 is the 26th anniversary of the declaration of National Wattle Day, as well as the 25th anniversary of the Australian Republican Movement giving its support to National Wattle Day celebrations throughout Australia. The Australian Republic Movement will be celebrating the coming of spring and the blossoming of new futures all around Australia in the week leading up to National Wattle Day. From Hobart to Williamstown, Geelong, Mandurah and Gosnella, there will be celebrations and sausage sizzles to bring in spring and celebrate the coming Australian republic. The Wattle Day celebrations were kicked off earlier in August when Peter FitzSimons, National Chair of the Australian Republic Movement, joined with Labor, Liberal and Greens MPs to rally support for a republic with a grassroots-based national campaign day on 1 September. Wattle Day has been celebrated annually on the first day of spring since 1910, when a sprig of the golden wattle is traditionally worn. However, the first known use of wattle as a meaningful emblem in the Australian colonies was in Hobart Town in 1838, when a resident suggested wearing a sprig of wattle to celebrate the golden jubilee of the landing at Sydney Cove. In this seemingly small gesture lay a suggestion of an independent Australia. Wattle is a broad and inclusive symbol of an egalitarian, classless, free citizenry. It grows in all parts of Australia, differing varieties flowering throughout the year. This democracy of wattles – the fact that they grow in all states – was the overpowering reason why the wattle and not the waratah was chosen as the floral emblem in the early twentieth century. It is a symbol that comes directly from our land. Wattle is Australian and represents us all. 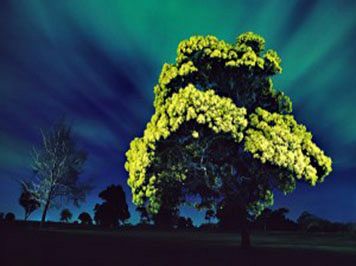 Like the Southern Cross, the appeal of wattle is not first and foremost to the idea of nation — but to the idea of place. The future Australian republic will also project a sense of feeling of place. At the moment, the Australian Republican Movement is focused on achieving an Australian as Head of State. However, the republic is not just one person. The spirit of the future republic will be embodied in not just the Head of State but in place. Wattle touches all levels of society. Early pioneers and World War I diggers were buried with a customary sprig of wattle. Then Governor-General Sir William Deane took wattle blossoms to Switzerland to commemorate young Australians who died there and Prime Minister John Howard wore sprigs of wattle at ceremonies after the Bali bombings. “...wattle has journeyed with us in kitbags, pockets and letters to places that become synonymous with our shared story; be they Gallipoli, Kokoda or Swiss canyons." Australian athletes wear wattle-inspired green and gold uniforms and those honoured with an Order of Australia receive awards with an insignia designed around the wattle flower. Independent Australia believes in a fully and truly independent Australia, a nation that determines its own future, a nation that protects its citizens, its environment and its future. A country that is fair and free. Let’s all take a moment this National Wattle Day and reflect on the wattle flower which symbolises an egalitarian, classless, free citizenry. So, when the blaze of wattle lights up the Australian landscape each year, let’s all remember that the wattle is a symbol of our land that unites us all. Change Jan 26 to National Day of Reconciliation - holiday, but expectations for community involvement. Move Australia Day to Wattle Day.